Investments Report is a new site feature reporting agency investments on business development and infrastructure projects throughout the state of Oregon. 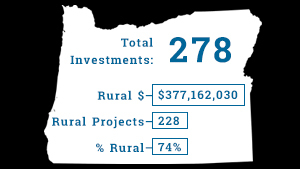 Investments are broken down by fiscal year or quarter, by program, and also highlights projects in rural areas. Trouble with local or state government? Contact the Small Business Advocate for help.